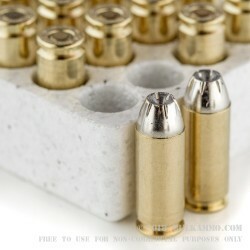 No one will argue with the fact that 10mm ammunition is one of the most potent personal defense rounds available. 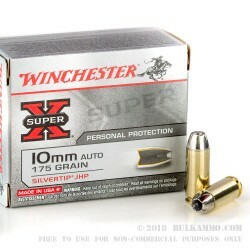 But would you believe that the Winchester Silvertip, released many years ago in 10mm performs almost on par with ammunition that has been released in the last year? 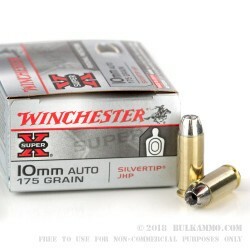 It’s true, the 10mm Winchester Silvertip in 175 grains, offers incredible penetration, velocity and energy dump. Producing an astounding 1290 feet per second velocity and 649 ft. lbs. of energy in what can only be considered by today’s standards as a “light 10mm load”, this is still a powerhouse self-defense round with incredible penetration (16+ inches) and offering a better price point than most modern engineered ultra-premiums in contention with it. So, it’s inside of the recommended penetration layer (12-18” in FBI spec gelatin @ 10%), and offers a heavy energy dump early on, and producers great wound channels, in a round that costs 35% less than its competitors. The Winchester Silvertip in 10mm, is a clear winner of a self-defense round and offers peace of mind and good relative pricing for those who need to rest easy at night about threats and about economics.